HOT WINTER SALE: May I purchase this Gof Driver for only $2 ? yes, many sold, a few remaining! Hurry while supplies last! ProThrowbacks now carries their own premium quality brand of baseball gloves! For a full story, click here and find out the details. Congrats to Adrian Basilio for winning the 2017 Christmas Bike Giveaway sponsored by ProThrowbacks and American International Learning Academy. Over 500 people participated in this years' grand giveaway for ages 5-13. Jan 2, 2018: For the second straight year, ProThrowbacks group led the NFL in participation for both the 2016 and 2017 in the NFL Perfect Challenge contests held online from Sep-Dec 2017. Houston Thugs who remained in the Top Ten through the entire season took home the first place away and will receive their first place gift after communication between both parties. Jan 2, 2018: ProThrowbacks crowns champion "fefetop" for winning our first ever sponsored NFL Weekly Pick'em contest. Ou group ended up as the 10th most popular group during 2017 and we look forward to be one of the leagues' top three groups next season. Congrats to Ferenc Gábor Végső, NY Giants fan from Hungary for winning the 2017 Weekly Pick-em, his choice of jerseys was that crazy character LAVAY from the movie Any Given Sunday. Ferenc is our first International winner and a clue to all of us not to choose our favorite team to win each and every week. We know Ferenc will be next year and hopefully, he'll invite additional people from his country to participate. A special congrats go to Miss Macrino (Mac) Palo at ProThrowbacks for winning our internal competition destroying all other ProThrowbacks staff and management by winning the fantasy league, perfect challenge, and weekly pick-em', this was Mac's first year for picking the winning teams and fantastic week to week competition. HAVE YOU VISITED OUR MUSIC STORE LATELY? Congrats to Susan Go and her daughter Audrey who received their free mini-mountain bike Christmas Eve at ProThrowbacks - Pure Gold Duty Free Dec 24th. Over 150 children ages 5-15 participated in this years contest. For those who didn't win, may be contacted by either ProThrowbacks or partner American International Learning Academy about future programs and giveaways. PROTHROWBACKS FAN OF THE YEAR? If you're traveling to Clark and enjoy sports or collectibles, we highly recommend that you visit ProThrowbacks, the #1 sports and collectible store in Central Luzon. ProThrowbacks, a long time investor within Clark Freeport Zone is only a few minutes from the airport. ProThrowbacks features several retail stores inside the Pure Gold Duty Free Clark. 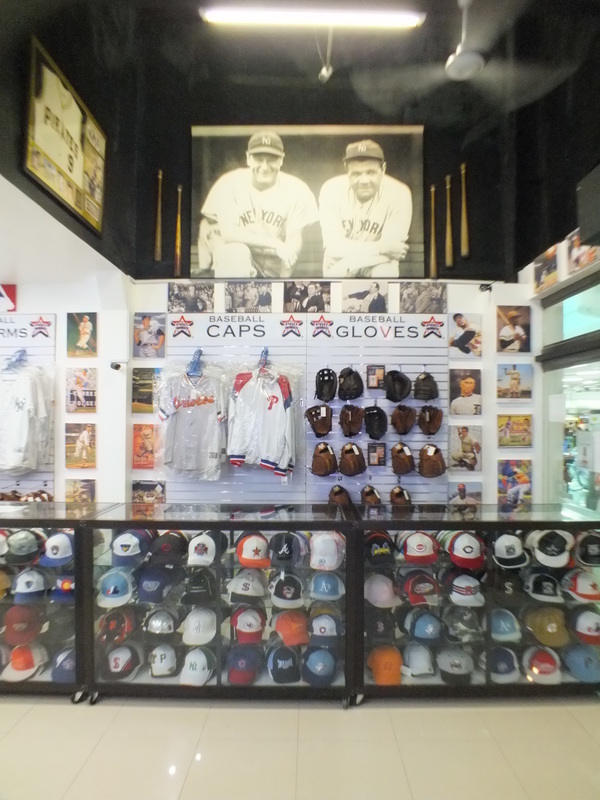 ProThrowbacks ranks among the best sports stores in the entire S.E. Asia region featuring licensed merchandise from Adidas, Reebok, New Era, Spalding, Yonex, Umbro, Upper Deck, Callaway, Heavy Putter, Wilson, Everlast, Babolat and many more U.S. Import Direct such as Nike, M&N, Gold's Gym, Mizuno, Puma, Ping, Cobra, MacGregor, Powerbilt, Taylor Made Quick Goal, and more. ​ProThrowbacks is a valued commodity to the entire surrounding community and the owner provides a consistent effort to offer premium quality merchandise at a reasonable prices. The majority of customers are from the Clark Zone with many visitors from outside the country who want fantastic prices on premium merchandise. Prices for various items start at $1. With over 30,000 items in stock, of nearly all sports to include golf, basketball, football, soccer, baseball, hockey, volleyball, badminton, tennis, bowling, darts, table tennis, horse shoes, and the largest selection of collectible items such as cameras, clocks, LP's vinyl records and 45's, sports memorabilia, and some extremely rare items, some that date back 50 years. ProThrowbacks is a active member of the Clark Investors Locators Association, USGA, Golf Collector's Society, Mimosa Senior Golfers Association, and Pro Football Researchers Association. ProThrowbacks has a stable supply of both new and pre-owned golf clubs, golf sets, golf bags, caps, tees, balls, gloves, shoes, and can even offer instruction to those who need some pointers. Simply put, if you're looking to play golf or do sports on Clark, ProThrowbacks is the place to be. ProThrowbacks specializes in meeting the needs of the athlete, fan, and the curious. Please stop by the next time you're at Clark, its worth the trip! If you don't have time, you can buy online, we try our best to take photos of items and place on facebook before we bring to the store. For those working on Clark and live in Angeles City, Dau, Mabalacat, please stop by ProThrowbacks and checkout or large range sports items. Thanks to all of our customers! We've had visitors from so many countries and regular walk-in from Clark. We have made many new friends and developed even better relationship with our long time customers. The staff in our stores and main office work extremely hard to get you the best quality brand name items at the best possible price. Our All-Star staff look forward to meeting you in the near future. This section is dedicated to those who is extremely special and his love for sports and his favorite player. His name is Dave M. (and sons) and they're our "Customer of the Year". Congrats to Dave and sons.